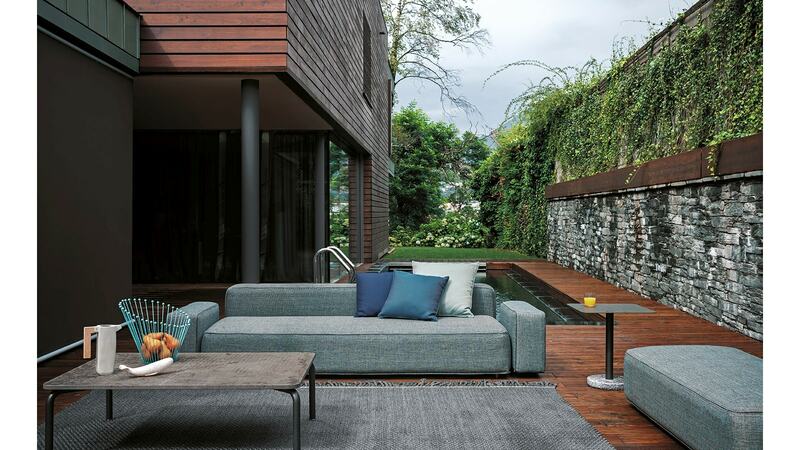 DANDY is the new revolutionary outdoor system by RODA, which includes all the functions of a textile sofa for indoor use, intimate and familiar. Designed by the unmistakable talent of Rodolfo Dordoni, DANDY is characterized by the versatility of its design, the technological innovation processes and the highest quality of materials used. The “soul” of DANDY consists of an aluminum frame, lightweight but extremely strong, hidden by a padding with a “total outdoor technology ” completely draining , breathable, and weather resistant. DANDY’s covers are available in a wide range of fabrics, with an outstanding natural beauty and an appealing color palette. The covers, fixed to the structure, are easily removable to be stored during the winter season, or to be cleaned. DANDY is a modular project that allows multiple compositions, to enjoy the conviviality and to meet the various needs of customization and space. The seat (available in size 225x75cm, 150x75cm and 150x130cm) and backrests / armrest (225×22 h60cm, 150×22 h60cm, 130×22 h60cm, 75×22 h60/44 cm) are indeed configurable for any environment, from the most intimate and cozy, to the widest and lively, from private to contract.